On a recent walk through the forest, I came across a majestic nest tucked away in the branches of the spiky Black Hawthorne trees. This forest is called the Magpie Preserve and after some quick research, we learned that this is a magpie nest! 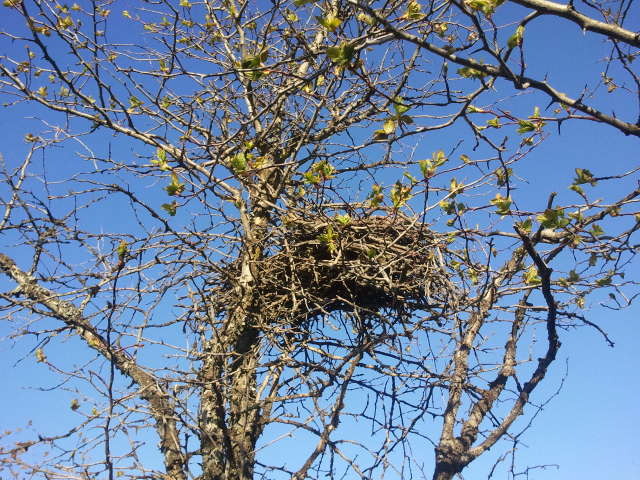 The sticks and branches of the Black Hawthornes are very spiky, but this nest looks expertly constructed using only short branches that are packed together tightly. The Magpie is a unique bird in America. Not only can they remember faces and enjoy shiny objects, but it’s one of only 4 birds who sing songs and have a tail that is longer than half its body length. The beautiful striped tails of magpies make them easy to identify and adorable to be around. We found many of these nests in the forest today and love that we get to make our home near these majestic creatures. If you see one of these, look around! A magpie might be right nearby.